The head of Egypt's armed forces gave politicians 48 hours this late afternoon to answer demands made by the Egyptian people or the military would offer its own "roadmap for the future." In a statement read on state television, General Abdel Fattah al-Sisi called mass protests on Sunday, which called for Islamist President Mohamed Mursi to resign, an "unprecedented" expression of the popular will. Egyptian voters mandated him for a full [four-year] term and it is improper to cut it short under street pressure. He is eligible to say all this, but his duty is also to check his watch. He is capable of mobilizing millions of loyalists in face of the opposition’s millions and he can get Brotherhood minders to guard the palace should the army equivocate on his protection. Despite this, it’s the president’s duty to check his watch. At the same time, the president can’t accuse the crowds gathered yesterday at Tahrir Square and opposite his palace of being remnants and thugs yearning for the former regime. This gimmick has been so overused that it just doesn’t hold water today. He can’t say the millions who signed the Tamarrud petition [demanding his resignation] are liberals involved in a Zionist-American plot to abort the revival plan he carried to the palace. The president cannot deny his first year in office was marred by terrible chaos and growing splits at street level and by discontent among non-partisans who voted for him lest Shafiq’s victory led to the old regime’s restitution. Likewise, the president cannot contest the figures of economic meltdown, soaring unemployment and poverty and declining services and security. Nor can he disprove the impression that the Brotherhood’s first year in power unmasked its dearth of experience and qualified cadres and its incapacity to manage state affairs. Two weeks ago my journalistic inquisitiveness took me on a visit to Egypt. I did not want to write about the big showdown there from afar. The showdown concerns the Brothers in Egypt and everywhere else. It also relates to political Islam and the Arab Spring’s outcome. I met with both opposition and Brotherhood leaders. I sounded out media people and ordinary citizens who imagined the (25 January 2011) revolution would throw open the doors of hope, make bread more readily available, and revitalize Egypt so she can recoup her identity, spirit and soul. On leaving Cairo in the evening, I was very concerned about the days ahead. I felt millions of Egyptians were deeply perturbed, fearful as never before and primed to burst in anger. One is nervous about Egypt going bankrupt. Another is anxious about someone tampering with Egypt’s spirit. A fifth suggests the army should make a move before the volcano erupts. The Brothers -- rather than make a “big sacrifice” – chose to put their fate and Egypt’s on the line by contesting the presidential elections on the urging of a few of their careerist politicians. Morsi misread the revolution’s messages and the mandate’s constrains. 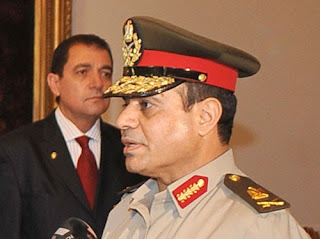 Mistakes piled up with mishandlings of the constitution, of the judiciary and of Egypt’s spirit and identity components. The accumulation of mistakes rekindled the revolution’s hot ambers. The flowing lava presages a volcanic eruption. The Brothers entered the presidential palace before their time, and their precipitous entry awakened the volcano. It’s hard to see the Brothers cave in to Tamarrud’s protests. What is certain though is that Morsi’s stay at the palace will prove exhausting to the Brotherhood and the country. There is nothing worse than sitting on the fringes of a volcano.